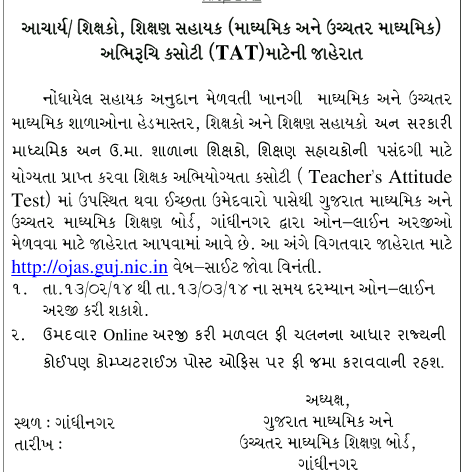 > For Notification Please Click Here..
Teachers Aptitude Test (TAT/HTAT) Exam GUJARAT 2014 - On 13th February 2014, Govt. of Gujarat announced entrance examination for Secondary (Madhyamik) and for Higher-Secondary (Uchhatar-Madhyamik) is TAT & for Teachers and Head Master vacancies is HTAT. Click here to know your result, see your Result directly from Official website. TAT exam was held on 27 July, 2014 at various cites of Gujarat. Please Click below to view OR download Answer Keys, it includes all the Subjects & general knowledge paper. Click here, for "Official Notification of TAT 2014"
Click here to download from Rijadeja.com website! No updates available as of now! !